Grounding is of the utmost importance, and every outlet and all the cables must have the grounding or earthing system present and connected properly, both to the outlet box and to the devices as required. 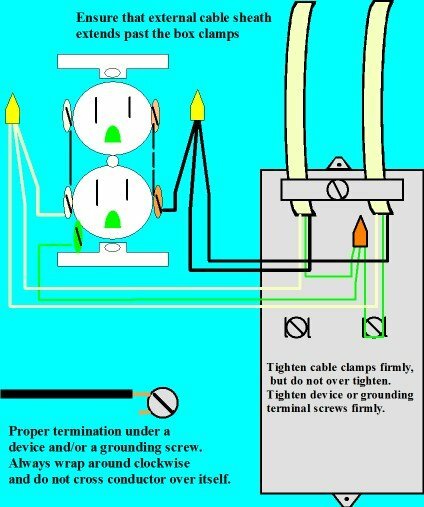 Wiring diagrams on our site usually don’t include the ground connections but this does not diminish the importance of grounding. I do this to avoid clutter on the wiring diagrams, and to focus on how to make the circuit work the way it should. Ground wires are always the first connections that you make when connecting devices or adding circuits, and should be the last thing you disconnect when removing a device. “A permanent and continuous conductive path to the earth with sufficient ampacity to carry any fault current liable to be imposed on it, and of a sufficiently low impedance to limit the voltage rise above ground and to facilitate the operation of the protective devices in the circuit”. Always reference the wiring diagrams listed here to see how the grounding connections should be made, both to the outlet box, and to the devices. Typical connection methods for an electrical outlet or receptacle. Here is a typical connection wiring diagram for a switch device and outlet box connections. Here is a typical connection wiring diagram for a light outlet, box and fixture connection. Please refer to these connection wiring diagrams to get the correct details on how the ground connections should be made before checking the wiring diagram you need to reference for your particular home wiring scenario. Another minor issue with some of our wiring diagrams is that in some cases where a white wire is used as a hot conductor, either in switch leg situations, or as a traveller in a 3-way or 4-way switch network, the white conductor is not shown with means to identify it as a hot conductor and not a neutral. This will be corrected soon, but in practice, always identify a white wire by coloring in a section of the wires insulation with a permanent black felt marking pen, or apply a wrap of black (or red) tape near the connection points. If you see anything on our website that you have reason to believe is not completely accurate, please let us know by going to the contact us page on the website. 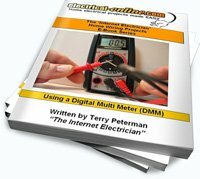 This entry was posted in Creating a Wire Diagram, Indoor Wiring Diagrams, Outdoor Wiring Diagrams, Understanding Wiring Diagrams, Wiring Diagrams and tagged bonding, connections, earthing, electrical outlets, electrical receptacles, grounding, outlets, proper grounding, terminations, wiring diagram for light fixtures, wiring diagram receptacles, wiring diagrams for light switch, wiring diagrams for outlets. Bookmark the permalink.